Last month, Kramer Electronics made two new product introductions aimed at long-distance, reliable, and high-performance transmission at ISE 2015. Kramer says it is among the first to incorporate Valens’ Colligo chipsets. Kramer says it is among the first to incorporate Valens’ Colligo chipsets. The TP-590RXR and TP-590TXR extenders let users connect any device over a single twisted pair cable without compromising on quality or performance. Kramer's range of extenders implement the entire set of features supported by HDBaseT 2.0, including USB 2.0. “Kramer is one of the first to incorporate Valens’ Colligo family of chipset in its new extenders. This will significantly expand the reach and functionalities enabled by HDBaseT, and benefits installers worldwide,” said Eliran Toren, vice president of sales, at Valens. 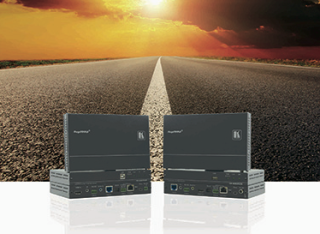 “Kramer is at the forefront of developing and manufacturing HDBaseT products. As such we are always staying ahead in adopting the most advanced HDBaseT technologies, while relying on our excellent cooperation with Valens. The new extenders offer the ultimate performance, reliability and return on investment. ISE is the perfect platform to showcase a preview of the first products incorporating Colligo with more announcements on the way during 2015,” said Aviv Ron, VP business development & strategy at Kramer.